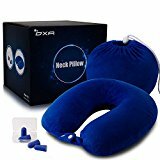 HIGHT QUALITY: all parts of this travel pillow is made of highest quality material, memory foam interior and earplugs,durable zipper, a luxury removable machine washable plush velour cover. DOUBLE BUCKCLE DESIGN: adjustable for more confortable size. Keeping best support and fixed. FREE BONUS &BEST SERVICE: 2 Pair of earplugs, in case of you have lost one of this little thing. Risk-free, 6 month money back with no question asked, hassle free. ERGONOMIC and Breathable: Free rotation, natural rounded support for cervical spine, Short hair velvet fabric, soft and comfortable. – A detachable machine-washable plush cover. – Adjust the shape to suit your own body contours using additional adjustable toggles. The OXA Memory Foam Pillow allows your neck to rest in a totally natural, and therefore tension free position. The pillow relieves pressure and reduces tiredness as it greatly improves the quality of sleep. The Aeris Memory Foam Pillow also stimulates blood circulation, eliminates muscle tension and reduces restlessness while you sleep.